Today is a mixed feeling day as I'm suffering from empty nest syndrome. As I mentioned in my last post, my house is home to a house martin nest, sadly just the one, but being colonial nesters, all the houses around me with suitable eves also have a nest. It was quite sad this spring because in the middle of that very dry spell between March and May they arrived back and attempted to build another nest on my house but there just wasn't enough mud about to build one. The solitary dawbs of mud now splattering my wall are all that is left of their gargantuan attempt to beat the unpredictable British weather. Most mornings (and evenings) I'm serenaded by the squabbling and activity of my martins. This morning though it was especially noisy. From the bedroom window, constant sleek bird shaped shadows darted hither and yon to the nest. Sounds of increasing activity drove me outside to have a look at what was happening, or at least what I thought was happening. And I was right. The fledgelings were leaving the nest, with encouragement from the adults and already emerged young birds. House martins when fledging strictly speaking don't permanently leave the nest, they vacate it and can come back at night to roost, or in bad weather can seek shelter there. But this morning, I think was the second brood's first foray into the wide open skies of Somerset. 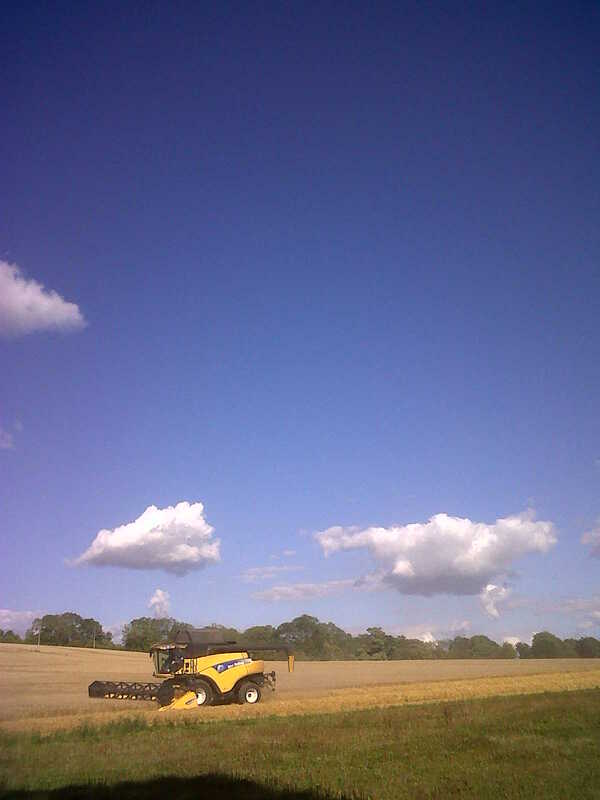 And a good morning too, blue skies after a night of deluging rain of Biblical proportions. It's always difficult knowing how many house martins are fledging. Normal brood size is 4-5 eggs and generally mortality of chicks is quite low. Today I think 5 fledged as at one time there were 7 birds around the nest, both flying and clinging to the wall. It was absolutely fantastic watching them as individual birds flew to the nest, around the nest, went into the nest and emerged out of the nest in very rapid succession. Occasionally a head would be seen at the nest entrance and another bird would fly up to it, chattering away, before both birds flew off in a wide downward arc and away, only for the whole process to be repeated again. Last year my pair managed to raise 3 broods, they finally left in early October. I don't think this year is suitable for three broods, and in a way I hope they don't lay again because if the weather deteriorates they'll just abandon the chicks and head south to Africa. I will have a think over the winter whether there's a way of providing ledges of something on the house to help more nest be built next year, as I'd love to have half a dozen on the house, no matter how messy they make the windows. It's a worrying time for lovers of house martins. Although there are about 3-400,000 pairs in the UK at the moment, this is actually a 60% or more drop in population from the 1980's and why the bird has been amber listed in the IUCN system since 2002. No one really knows why they are declining so fast, but as they are intricately linked to human habitation (even their scientific name urbica and colloquial name refer to dwellings) there may be a link to modern houses being less suitable, having fewer eves and overhangs. Certainly fledging data suggests pairs of adults are raising chicks with no change in mortality. But then again, insect numbers are fluctuating, and with climate change the Sahara is expanding. Is it just too far now to fly south to their wintering grounds. However on the plus side if winters continue to warm in Europe, which after the last 2 winters seems astonishing, potentially martins may follow a small percentage of their swallow cousins who increasingly seem to be able to overwinter in north Africa rather than fly across the Sahara. Originally martins were cliff dwellers much like their cousins the sand martin, although the latter make nest holes in soft sediment and not nests. At some point now lost in the depths of history, they took to nesting on buildings, attaching their mud nest cup under eaves, presumably when houses began to be stable enough to replace the rigidity of rock. If you think about it the first solid houses built were castles and they were built often on rocky outcrops. So did the martins just make an obvious leap, when natural nest sites were exhausted. The nest is just fabulous and takes up to 10 days to build, and over 1000 beak sized pellets of mud. So that is 2000 flights from and to a nest in 10 days. An enormous effort. And that's possibly why this year other birds failed to make new nests on my walls. My theory is as everywhere nearby was parched earth, the nearest mud is the river, a quarter of a mile away, just too far to be worth while. But it is worth it as if a new nest successfully fledges chicks, the adults will return each year to re use it with just a light renovation each spring. The other interesting thing with the martins around me is there are a lot of nests around my house but few elsewhere in the estate. The house and a few others around me were built in 1997 and half a dozen used to be the show houses. Show houses tend to be built literally in a building site. My theory is then that the martins again spotted an opportunity and built on these new show house cliffs surrounded by the mud of a building site. A perfect habitat and they have kept coming back ever since. Whereas in other parts of the estate they never got established and as the mud was built over, they could not colonise beyond this initial colony. I don't know either why martins never seem to build nests on dark eves, always one painted white. Most of the houses here have dark eves. References to house martins in literature and folklaw are surprisingly few and far between. Which I find odd given that the swallow has been a writers muse for generations. but I think we should change that because they are such beautiful birds. Christians think the bird is lucky, possibly as it has connections as a servant of god, and in olden days it was thought lucky to live in a house with a martins nest if the young fledged successfully. I'd agree with that, I'm a very lucky man to share a house with such wonderful birds of the air. I always think there's something magical about heading into Autumn. At the weekend dew covered lawns shrouded in dawn's rolling mists, gave way to clear blue afternoon skies, rising from the landscape like a Phoenix to create a hot and yet quiet day. Only in Autumn do these days occur, when by mid afternoon everything is quiet, sounds travel for great distances producing that special stillness Autumn provides. It is hard to believe it will become cool again by nightfall. But it does. I had a weekend on my own this weekend, and decided by choice not to leave the house. I occasionally do this when feeling jaded with the modern world, or exhausted. By nature I'm quite a solitary person, but also love being part of a social group, often found holding court in the midst of a gathering. But growing up an only child, spending time on my own and not having to perform the mental agility of genteel conversation with friends or family is a real joy for me. And so it was this weekend. I spent a lot of time just relaxing, thinking, emptying my mind of all thought. Avoiding the news both broadcast and printed helped, best of all though, not driving for a whole 3 days. We all rush and bustle about too much and never take time to stop and stare. 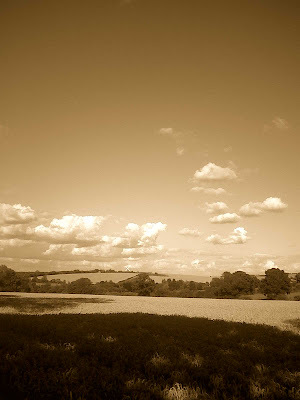 Sometimes in this mood I will wander the countryside by myself, often heading to West Dorset or down into Devon, but this weekend with the warm weather I just sat and read, sat and thought, relaxed outdoors in the sun, generally doing absolutely nothing. I know I'm lucky being able to do this, when many other people have family responsibilities or work commitments, but then again why not enjoy being able to do this. One day I will not be able to. My job is fantastic, but can be exhausting. On Thursday I spent a most enjoyable day watching stone curlews at a secret location in Wessex, a busy 15 hour working day. But to hear those thick-knee birds calling in the night as they woke from their day-roost was worth all the planning and the miles. Even the creeping tiredness as I drove back down the M4 at 1am on Friday morning, failed to dampen my mood. But even when I arrived at home, the wildlife thrill hadn't stopped. Unpacking the car at the dead of night, the second brood nestlings in my house martin nest were twittering. I stood in front of my house. No other sound could be heard in the area except the gentle squabbling of baby house martins, fidgeting in the nest. Young birds that in a few short weeks will head a long way south on their first migration, much as the stone curlews, I'd seen earlier in the evening. Wildlife encounters never ever make me feel other that uplifted. On Saturday, for once I had time to idly scan across long forgotten books in the office and by chance pulled out a book by Ralph Wightman, called Watching the Certain Things. This book had been withdrawn from a library years ago and I bought it for the lino cut images but then, had never read it. Opening the book idly the penultimate chapter was entitled "Solitude". I love these coincidences when a feeling in the hear and now often manifests itself as an action or deed which exactly mimics the beholders view or thoughts at that time. I read this chapter; he lived in Dorset and described wonderfully the area of West Dorset I go to for solitude at times of worry. So 50, 60 years before I read this book, he too had the feelings I, and many others have had, in that part of Wessex. 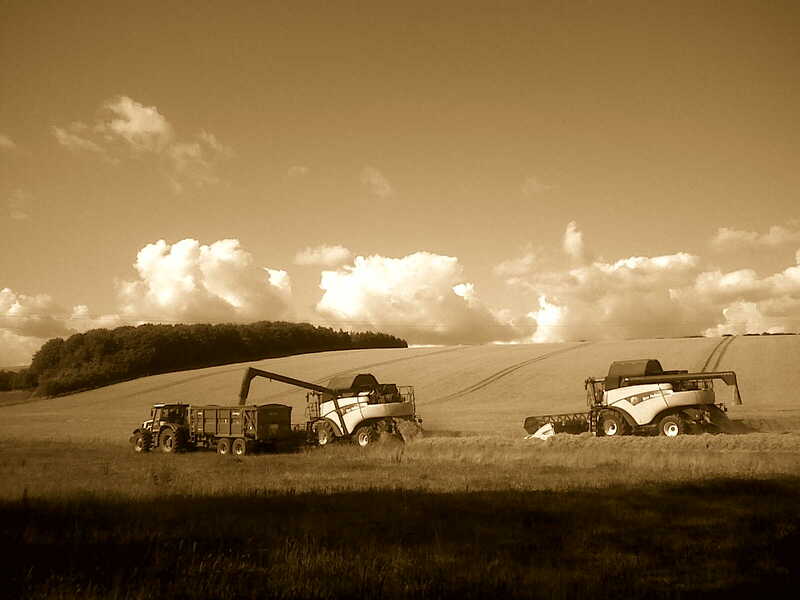 Small fields, high views and a feeling no one lives here. I love it. But for me this weekend the absolute treat was having an outdoor fire in the evening, from which these photos came from. I lay there letting half of my body roast slowly like a chicken, the other half bathed in luxurious coolness as the night became darker. By 10pm the stars were out and I lay back in a reclining chair in the middle of the garden, watching a satellite pass overhead. Just the one shooting star made its appearance tonight, but that's enough for me. My wish? Well to be bathed in the scent of woodsmoke, watching bats as they hunt, stars as they shine, and to witness the simple pleasure of gazing at shapes made by the dying embers of a fire on a cool Autumn night, for a very long time to come. 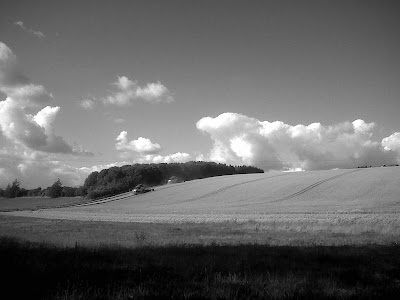 This afternoon Julie and I went for a walk around the lanes and fields of her village. 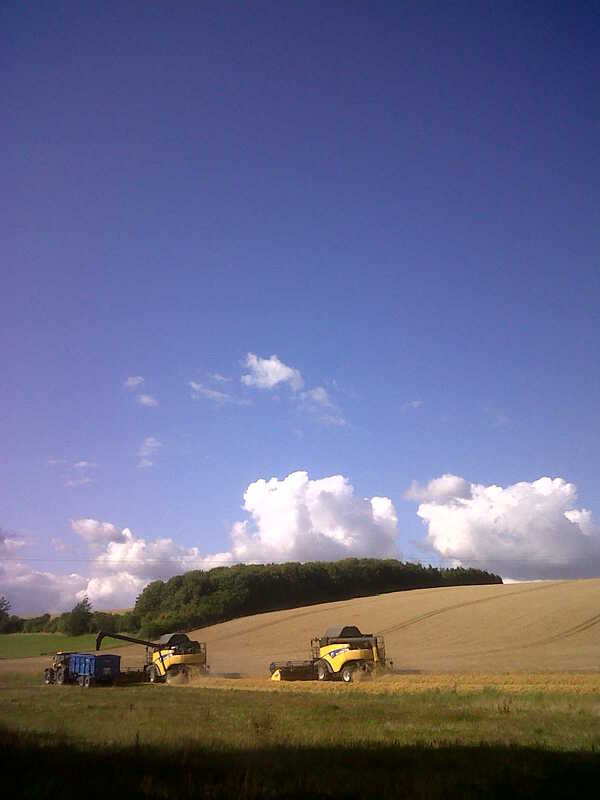 A glorious afternoon walk of about 5 miles made all the better for being adjacent to a field as the combines came in. 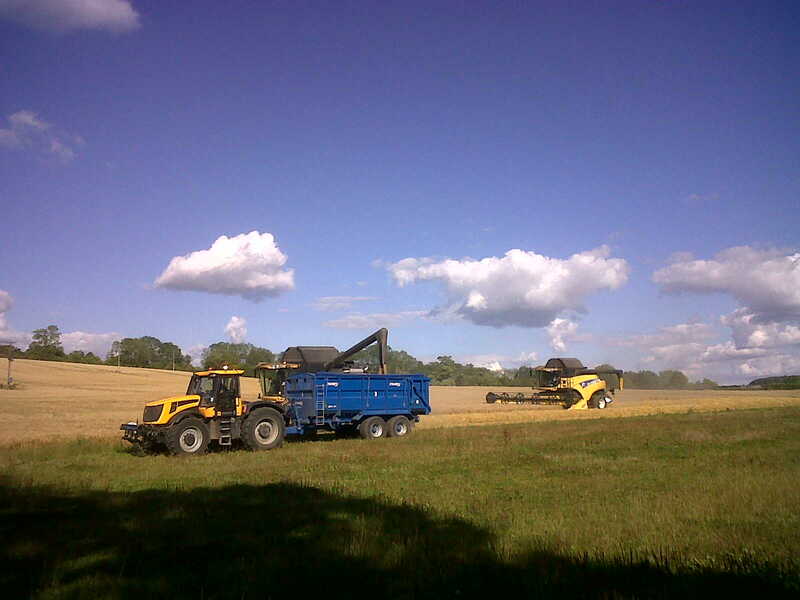 I love watching combines, takes me back 30 years to when I used to work in the fields at this time, both as a schoolboy and later as an agricultural journeyman. I didn't have my camera with me but the following images were taken on my Blackberry. 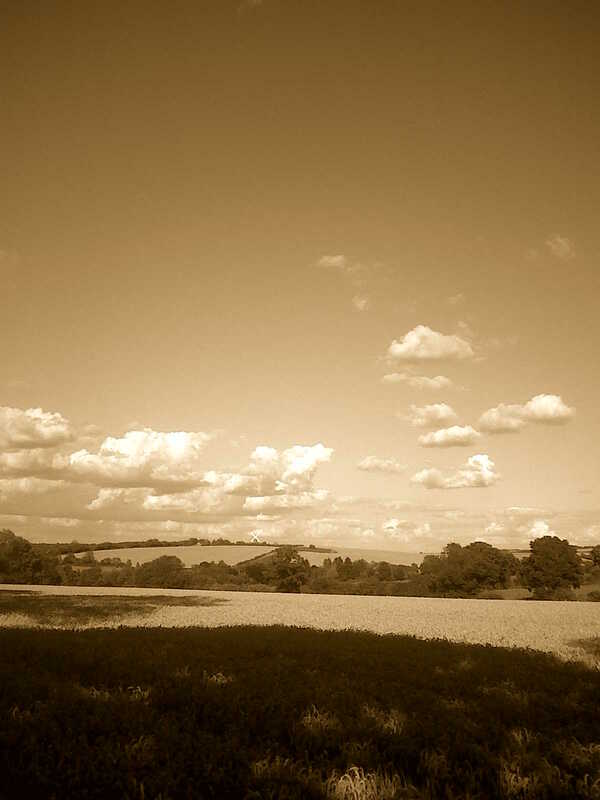 I'd never used the black and white or sepia settings before, not bad for a mobile phone. Shame I hadn't my camera though as these would have made super subjects for black and white images. 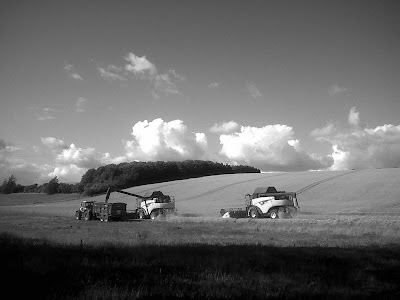 Apart from the fact these are modern combines, black and white works for farming shots I feel, makes them seem timeless. And 2 colour ones, just for the record. Wish I could drive one of these, looks like fun.......!! I've just read a fascinating new piece of research on the movements of Puffins after fledging. In an article published on 2 August 2011, by Tamera Jones, young Atlantic puffins migrating for the first time scout out their own routes, rather than relying on genetic programming or help from their parents, the latest study reveals. Studies in Skomer reveal some birds go to waters off Greenland or Iceland for the winter, while others stay closer to home or head out in the opposite direction into the Mediterranean. I love the way new ways of carrying out research are helping discover more and more about the birds we know and love. Well I notice it has been months and months since I have daned to post on the blog.....time and tide has no respect for a blogger. But today, I have time for a photo journey over the last few weeks as I have crossed England in the pursuit of the mighty airwaves. June saw me on the Farne Islands. A fabulous day although we had to get off pretty sharpish as the wind picked up and we were in for a choppy return to the mainland. The view from the hotel in Bamburgh wasn't bad either! And apparently there is a roseate turn in the middle of the arctic terns at the Long Nanny site up there. Later in June I popped up to Ingleborough to run about on slippy clints and deep grykes in limestone pavement country. July saw me back in Yorkshire, this time on Malham Tarn taking part in a research project to find Britain's rarest caddisfly, which is only found here. Being given permission to be out in the Tarn at night with a light trap was just magical, as thousands and thousands of grouse wing caddisfly emerged from the lake all around us. Well just a flavour of where I've been, and why sadly the blog took second place to being out there and doing it as they say.